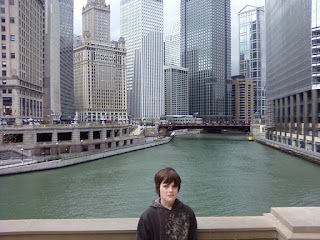 From there we hiked another mile and a half or so down Michigan Ave, and back up again to the Art Institute. This was the high point, by far. We saw Impressionists, Modernists, Realists, Cubists, and even a few Artists. To see some of these paintings almost brought me to tears. A few of the more memorable ones were the Rembrandt portrait of a Man with Gold Chain, which was positively moving in it's detail. Another was Van Gogh's self portrait and his La Berceuse paiting of a woman. Salvador Dali's works were amazing. I have nothing but complete respect and admiration for the talent of these masters. I can only think in two dimensions, these guys see in four. Their mastery of light, nuance, detail, color, subtlety, and shadow is mind numbing. I wish I had some of that artistic talent. Writing is one thing. Visual arts are a whole different sphere of the brain I think. One that I must have bumped playing football long ago. After the museum we did Millenium Park and had a good time taking pictures by the bean. We finished up at Giordano's pizza and had some amazing deep dish. It was a great day and I'm exhausted. Too exhausted to write anymore.